Okay, okay, she is a typical dog with typical jealousies. She is extremely curious which has led to her being lost in the neighborhood for half a day, a million holes dug to find the critter that her big sis loved to eat, hours spent investigating leaves that fall to the ground . Objects that have been moved from one place to the other fascinates her to no end. And if there are any black objects that have magically appeared, ANYWHERE, you had better hold your ears because she will let you know it is there until the alien of the dark side has been removed! Then there is the, at one time, new washer and dryer. She still watches it daily. It holds a hypnotic power that can transform her from a hyper little 5-year-old to a sleepy old gussy. And this is where the redneck comes into play. Mr. Moody’s recliner was the most used piece of furniture in the house. All three dogs had their own con-caved perches on varies spots of the chair with Mr. M in the center. The smallest one on the arm, next one was located at the top of the head rest and the big dog’s spot was wedged in beside the master, but she hated to share. Her ideal squatting spot was dead center and stretched out head to toe. She would actually look at you and whine until you came over to recline the chair for her optimal comfort. Both she and M, had worn the snuginess right out of the chair. Holes as big as babies bottoms were worn between the seat and back. Springs were poking where springs should not poke but her love for that chair was unmatched by any other piece of furniture. So you could just imagine her surprise when the Mister came home with a great big object. She watched him push, pull, and tug her little cloud of comfort out of its spot. She then saw him struggle, drag, and scoot a rather large dark (but not black) thing into its position. And that position was right where her old comfy sleeping station was just moments before. Mr. M said she had her misgivings. She crept up to it like it was alive. When he pulled the lever to show her it reclined she shot out of the house like it was a feral cat coming after her. When I got home I was surprised to see the new VERY large double recliner. It was nice and he could not wait to show me it was built for two. In reality, it was made for two skinny people or one Mr. M and one large dog, but we managed to squeeze in together. SuzieQ was barking and wanting up with us. Jeff was already in his usual spot minus his cozy nest like feel. Big girl was nowhere to be found. Later that evening Mutt was still MIA. I called her but she did not come in. I looked out the back door and there she was. She was back in her element, her comfy zone. Ya see, Mr Moody moved the old chair on the back porch until the weekly trash run. 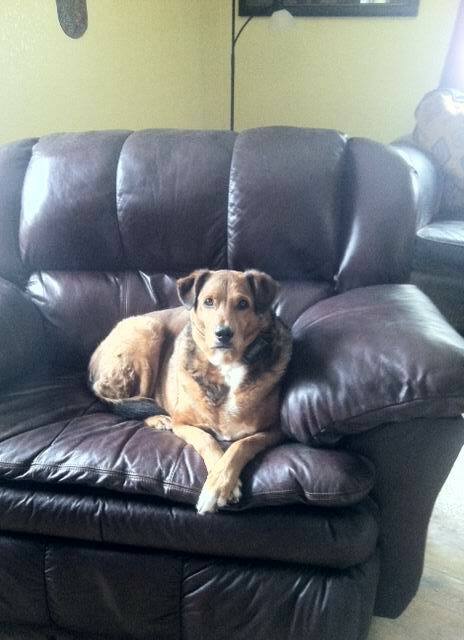 Mutt found it and staked her claim as full owner of the redneck backyard porch recliner. Yes my dog is a redneck dog and loves it. I know we should remove the porch recliner but it would just break her heart. She has tried to share Mr. M’s new chair but he keeps shooing her out of it. So the back porch chair will stay, at least until fall. 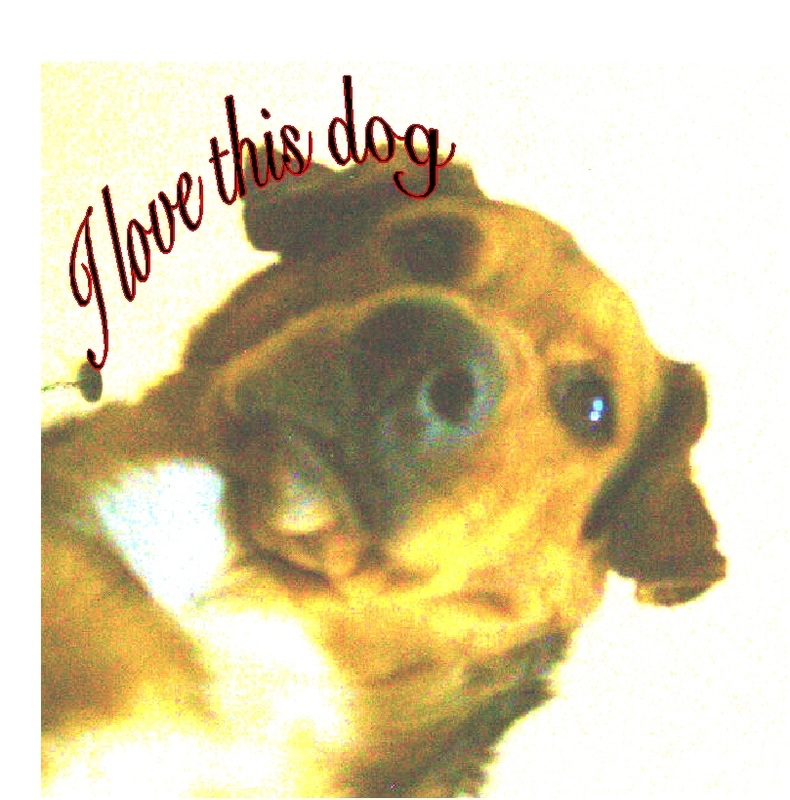 For the time being, my big old redneck dog can enjoy life once again. You might have a redneck dog if your canine likes to help you load the dish washer by licking clean each plate before it lands in the machine! You might have a redneck dog if “shot gun” means riding in the back of the pickup truck. You might have a redneck dog if “Flying American” means its ears are flapping in the wind while riding “shot gun” on the highway. 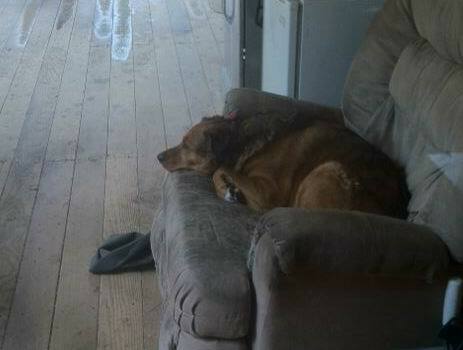 And finally, you might have a redneck dog if it has its own recliner on the back porch of its very nice home. A while back my washing machine started making funny noises. It would cough, crawl and leave little wee wee spots all over the floor. Mutt would head straight out the doggie door as soon as she saw me with the clothes basket. This kind of stuff freaked her out. Well, I didn’t need a crystal ball to tell me a new bill was in my future. I decided to go all out. I got a brand spanking new front end loader with, get this, the matching dryer. Kelly Rippa would be proud of me. I too can come home from a long days work, strip, throw the “worn all day” clothes in the dryer’s REFRESH cycle and out they come smelling clean just as her commercial promises. Mutt was so excited to see them pull out the old machine and very curious as to what was coming in. It took 4 guys to get them in and set them up. Apparently, the washer has 800 pounds of weight attached to the bottom. Delivery dude said it’s needed to keep the machine from doing cartwheels while in the spin cycle. Hmm. As soon as they left, I grabbed the clothes basket and out the door went Mutt. I turned it on and saw that it would take TWO hours to wash! What is that all about? How can this be energy efficient? My old rock and roll washer only took about 25 minutes to wash anything. I sat and watched it for a minute then came to the conclusion it was saving on water, not electricity. After a while, I noticed Mutt was no where to be seen. I went to call her at the back door and caught a glimpse of her in the laundry room. 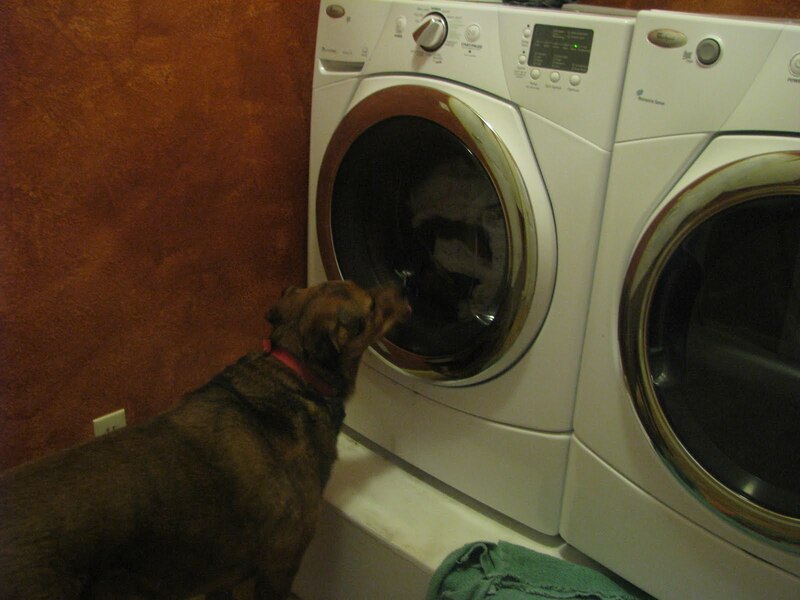 She was sitting in front of the washer watching the clothes through the front door window. She was mesmerized, in a trance of some sort. Soon it kicked into spin. She stood up with her back hackled. She was ready to bolt. Her head was just a-weaving back and forth. It started making a whistling sound as it hit full spin and that was all it took. She high tailed it out the dog door then turned to announce her disappointment! She must have barked for 10 minutes. Eventually, she crept back in slowly and quietly, as if the washer could hear her walk. Tippy-toeing back to the laundry room, she quickly peeked in several times. After her curiosity was satisfied, she took a seat and waited for the next show. The other day at work one of our vendors came in with a few goodies in his truck. He tells me his hummingbird feeder bottle brushes are perfect for cleaning out the lint vent of your dryer. Well, I’ll be dang. I thought this was a marvelous idea and took one home to try it. I could not wait to see how it worked. I pulled the filter out and stuck the brush in, swished it side-to-side then pulled it out. It looked like a fuzzy hamster had attached its self to the end of the stick. I looked down the hole and found even more lint. I poked it way down in there again, then without warning… Swoosh! It was gone. It was as if something just jerked it out of my hand and sucked it down to oblivion! Mutt was mildly entertained by my reaction. I know I should have panicked or at least worried really hard but all I could do was laugh. The more I studied my situation the harder I giggled. Every time I took a breath, Mutt’s tail started wagging uncontrollably. We were having a moment of laughter together. It was awesome. Finally, I regained my composure and came to the conclusion it could not stay down there. A screwdriver was in order. After a brief search, we- Mutt and I- were ready to tackle this problem. I started unscrewing every screw I could find. The filter housing would not budge. After talking it over with Mutt, (see photo) I decided the answer to my problem lied within. I poked my head in the dryer’s opening and proceeded to unscrew all the screws I could find. I still could not get it to come out. “DANG IT”, I yelled and at this, Mutt was all about finding out what was happening. She struggled to poke her head in too. 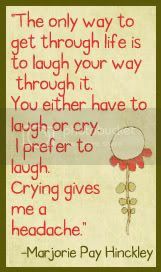 I started laughing again and I could feel her whole body swaying back and forth….we laugh a lot. She soon got tired of all this work and giggles and tried to remove herself. But her head was wedged in and she couldn’t get it out. Her eyes said full panic mode! I could not move either. I am not as skinny as I once was and she’s a bit on the hefty side, as well. Front-end washer and dryers are placed on pedestals to make it easier to load and unload. However, once you get stuck in one it makes it hard to get your balance just right so you can get back out. She wiggled and tugged until she was free then I heard the dog door and again her disapproval. I finally found the last remaining screw and removed the housing. The brush was resting right at the top. I quickly replaced the filter and shut the dryer door. As I was cleaning up, I saw three little screws. Oh boy, what to do? Without a word to anyone, I took my broom and sweep them under the dryer. Hey, if I need them I know where they are. 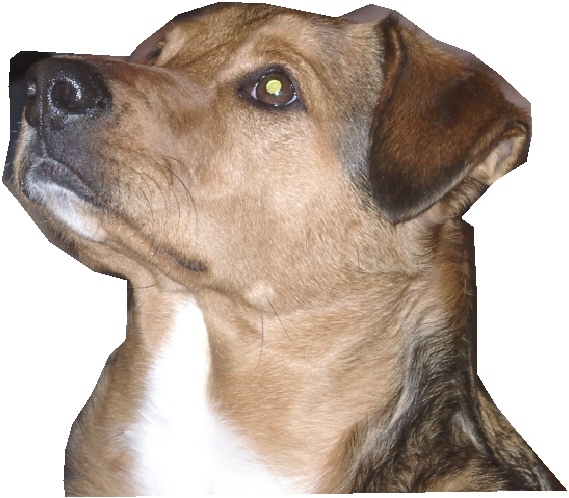 From the dog's point of view, his master is an elongated and abnormally cunning dog with arms and opposable thumbs. A dog is the only thing on earth that loves you more than he loves himself * My little dogs - heartbeats at my feet. Did you forget where that goodie is buried? One reason a dog can be such a comfort when you're feeling blue is that he doesn't try to find out why nor fix what is wrong he just loves you until you are better. A dog can express more with his tail in minutes than his owner can express with his tongue in hours. You Want Thighs With That? Bones: Mama always said blogs are like a hole in the ground, you just never know what you’re gonna dig up. Like all good watchdogs I try to keep a watchful eye out for great blogs! You can find a few of them under the Treats button at the top of my page. Have fun.